Hey, all! 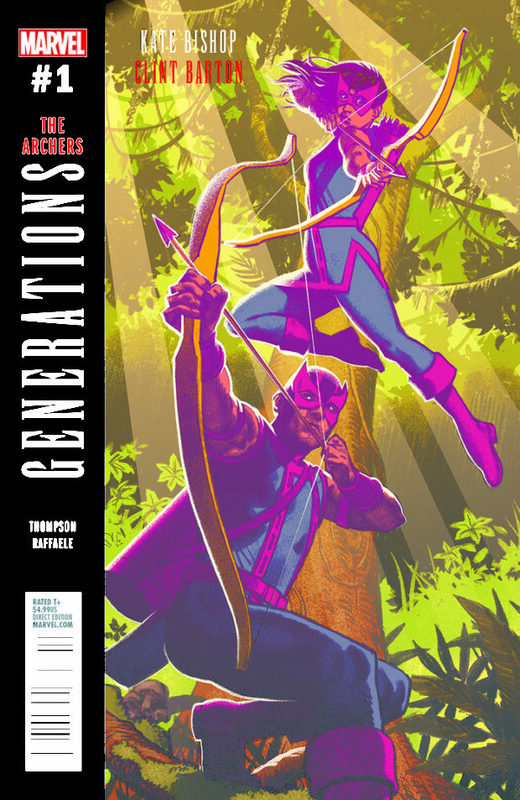 My run of Generations ends with one of my favorites: “The Archers.” I have been a fan of Hawkeye and Hawkeye since the Matt Fraction run. I LOVE that run. I love it so much, I had a class set of vol. one purchased for my graphic novel class, and a study guide can be found for it at the top of this page under resources. Check it out! Some cool questions in there. This issue, yet again, has a character tossed into an alternate time; this time it’s Kate Bishop, tossed into a Hunger Games-esque scenario, meeting up with a younger Hawkeye. She immediately proves herself as a friend, and they team up to survive and take down the baddie that has thrown a number of ranged weapon specialists into combat. The interactions between Clint and Kate written by Kelly Thompson are spot on, and the straight-forward art is not distracting to the script. We want Kate and Clint; we get Kate and Clint. No crazy panel layouts, no outrageous art…simple comic hero story with the Hawkeye smattering of humor: golden. The best thing about the book is its inability to take itself seriously. Towards the end of the issue, there’s an amazing opportunity to take the story to an emotional level that we might have enjoyed, but in typical Hawkeye fashion, that payoff is replaced with a laugh. I feel that to honestly appreciate this title, you need to have a relationship with these characters. If you do, please read this. If not, get one, and please read this.